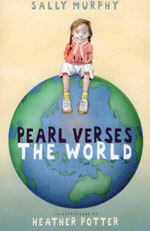 Pearl Verses the World by Sally Murphy. Candlewick Press, 2011. Currently available. Face Value: So endearing. Heather Potter’s illustrations have a gentle beauty. I would want to have this cover as a poster print on my wall. It’s intriguing but also soothing, somehow. Pearl looks expectant, bright, and ready to be your best friend. Don’t you just want to sit down and read this book from cover to cover immediately? Plus, the title is a pun. Puns are the best! Does it break the slate? Yes, it really does. This poem follows Pearl through a major life change, and throughout it all she shows how resilient she is. Although Pearl has a lot of questions, she still has a strong sense of who she is at her core. She also keeps a clear head through some irritating drama at school and is totally admirable in the way she navigates social situations. Who would we give it to? My first instinct is to share this book with young people who are coping with the loss of a grandparent – but then again, that might result in a great deal of tears because this is a book that threatens to induce a serious crying jag. Any child who is losing a loved one – whether through death, a change in family structure, or a move – would find something to connect with in Pearl’s story. I am in a group of one. Home has always been her haven from the tortures of school – until Pearl’s grandmother got sick. “Granny is fading. / So are Mom and me.” Pearl looks on as her mother takes leave from her job to become a full time caretaker for Granny. Although she understands that Granny cannot remember everything anymore, Pearl is still confused by what is happening with her family. Why is Mom so miserable all the time? And what can Pearl do to help? She’s lost, and I was so invested in Pearl’s well being as a reader that I just felt heartbroken. Elements of the story hit me hard because it is similar to some real life stuff that I have going on right now, and it left me sobbing. Although the book was deeply emotional, it never went over the top into melodrama territory. All of Pearl’s emotional ups and downs felt very authentic, and true to what a real life girl would feel in that situation. Mitchell Mason sits next to me at recess. and you have dreamy eyes. and I don’t need a boyfriend. I don’t want a girlfriend, either. and I like your poems. I adore this moment. It is a sweet, age-appropriate, realistic, and Slatebreaking boy-girl relationship scene. The emotional trajectory of this book is stellar, but what is even more impressive is the economy of words with which Murphy builds Pearl’s world. The brevity of language echoes Pearl’s quiet personality. Although she uses only a few words, there’s a lot going on inside Pearl’s head – and the language of the book beautifully reflects Pearl’s introverted nature. I randomly grabbed Pearl Verses the World off of the “New Books” shelf at my public library, and I am so glad that I did. This book packs a strong narrative, gorgeous language, and a Slatebreaking family of strong women into just 73 pages. It would be an excellent choice to introduce a beginning reader to the poem novel genre. This entry was posted in Middle Grade, Reviews and tagged Death, Easy Reader, Family, grandparents, Poetry. Bookmark the permalink.